I am so excited to introduce you to a new picture book author about to burst onto the scene. This is her first author interview, so it’s very special! 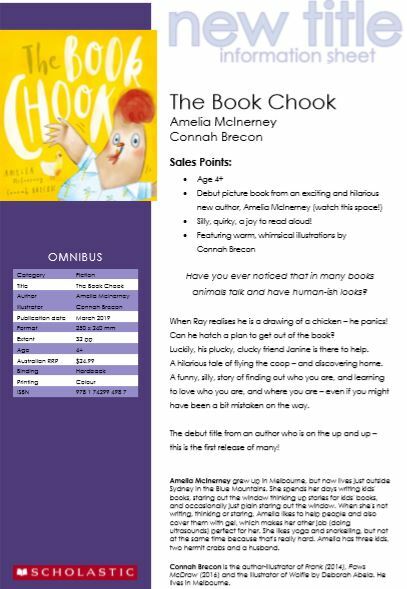 Amelia McInerney’s debut The Book Chook, illustrated by Connah Brecon and published by Scholastic is released on the first of March. Not only that, but Amelia has FOUR other books in the wings to be released over this year and the next. This might all seem so sudden, but clearly, a lot has been happening for quite a while behind the scenes to bring her to this point. We’re going to get a behind-the-scenes glimpse of how she got to this point. 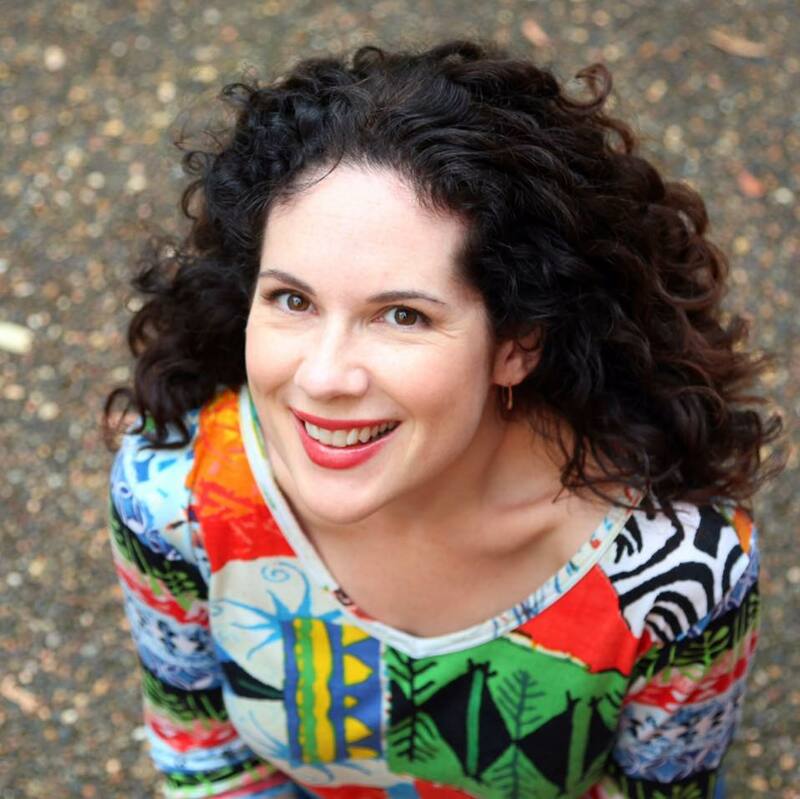 I’ve bumped into Amelia quite a bit over the past few years, at various CBCA and SCBWI events, which is how I know about her up-coming release. She moves in these circles with grace and enthusiasm, eager to soak up all she can in the industry and support others in the process. She’s kind, clever and creative, as no doubt you’ll discover in this interview. Let’s start with the excitement of your new book! What can you tell us about it? Thanks Debra. I’m so excited about this book! 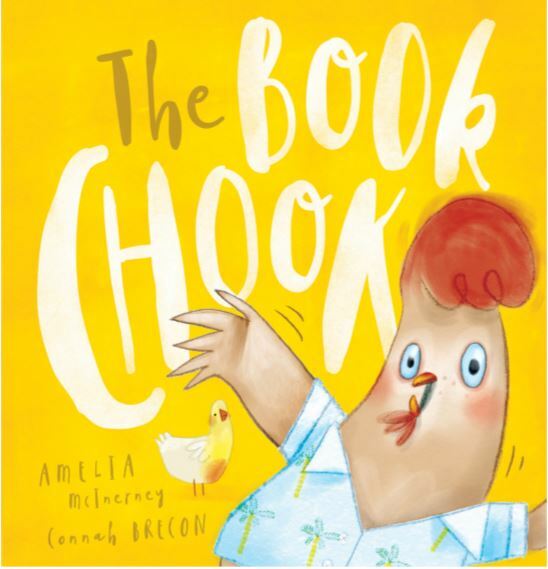 It’s called The Book Chook, and it’s a funny, rhyming picture book about a chicken called Ray, who freaks out when he discovers that he’s not actually a REAL chicken, but just a drawing of one in the book. Impulsive and garrulous, Ray enlists the reader to help him try to get out of the book in various interactive ways. Luckily, Ray’s deadpan off-sider, Janine, is there to help guide him towards self-acceptance. I hope adults will enjoy it as much as the kids. I was thrilled to be paired with illustrator Connah Brecon for my debut. (Connah recently did Deborah Abela’s Wolfie and he has more picture books coming out this year and next.). The Book Chook’s illustrations are so gorgeous. They’re full of character, colour and humour. I just love them. I do love a book that plays with form, and this sounds like just my thing! I’m excited to see it! The cover looks fabulous! 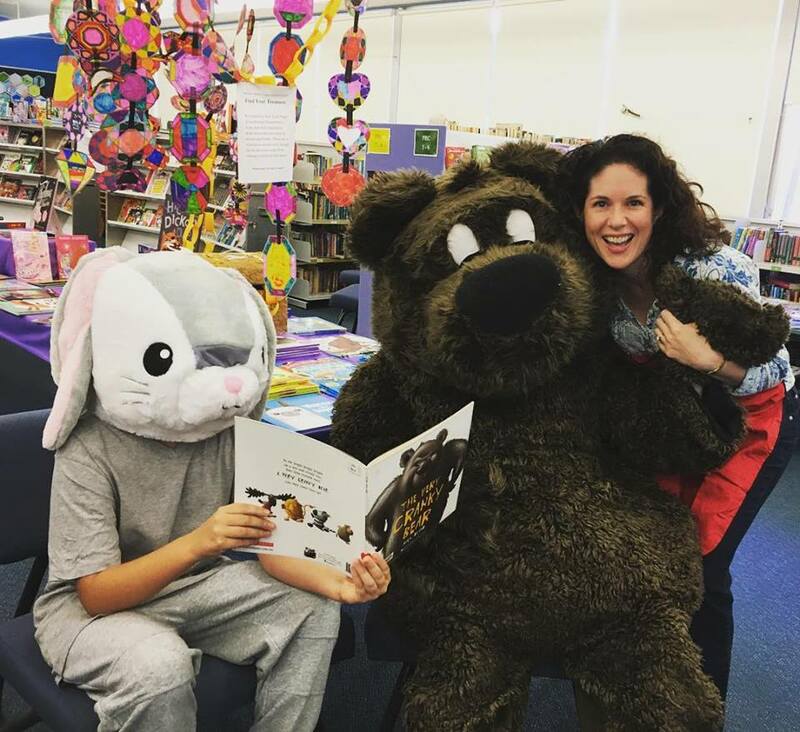 Who would The Book Chook be friends with on the book shelf, do you think? Umm… Besides other book birds, I think Ray would like to hang out with Pig the Pug, The Very Cranky Bear and Elephant and Piggie! If the cover is anything to go by, I’m sure he’ll hold his own in that company! What plans do you have to celebrate your first book’s arrival? I’ll be presenting The Book Chook, hot off the press, at the free SCBWI pre-conference event on Sunday Feb 24 at The Children’s Bookshop in Beecroft. I think this day could be the first time I actually see the book in print! I’m really looking forward to showing it to you, Debra, and hopefully many other JWFKers! I’ll also be launching it in Glenbrook (lower Blue Mountains) in early March! Oh yes! *rubbing hands with glee* I’m so excited to see it at the SCBWI pre-conference event, and I’ll be looking out for my invitation to the big launch! I said in the introduction, there’s a mountain of work underneath and we just see the tip of the iceberg with the finished product. So can you tell us how you started writing for children – what was your inspiration and what got you started? I started with the biggest cliché, the lightbulb moment! It happened when I was reading a picture book to my newborn baby and my three-year-old. I can’t remember anything about that book, but I thought it was terrible. I checked the front matter (before I knew it was called that) and saw it was published by a big American publisher. I thought ‘I could do better than this!’ *lightbulb here* ‘I want to do this!’ and I went straight to the computer to start learning about writing for children. I blissfully plunged into a new world of self-education, which I found so different to my previous studies in Radiography and Sonography. I was as keen as I was green, but my eldest was six at the time, so at least I had been reading picture books for that long! At this point, I noticed a pattern in my behaviour; every time I had a newborn, I would throw myself headlong into a creative project. With my first two, it was photography (of said newborns). This time, it was writing kidlit. But after just a few days, I knew I had found more than a new hobby. I’d uncovered a passion and I was completely enthralled. Lucky, because I’m not having any more kids! So, it was that lightbulb moment that got me started, got me thinking about writing picture books. But I have always loved the succinct cleverness of the form, and the visual element. I loved reading picture books as a child, loved reading them with my own kids, loved watching my husband read them to our kids. This is what makes me want to create them. I think this inspiration is strong enough to last me a lifetime. I love this story! And I love how you don’t have a teaching/writing background: you’ve come at writing completely fresh, you’ve researched where you could learn and realised the importance of education and practice in the craft. So, can you tell us more about how you got your writing to a publishable state? Not proud and not wanting to leave a stone unturned, I started by reading Writing Children’s Books for Dummies. Recommend! I bought a $5 Groupon for www.writestorybooksforchildren.com , an online course (of sorts). Highly recommend! I trawled the internet for months, finding sources like kidlit411 and Harold Underdown (and followed links from those sites) learning about the craft and business of writing for children. I think I even read a book titled just that, plus a bunch more with similar titles. Because I was living overseas and caring for my three young children, and because I was often literally snowed under in the Winter that followed my third baby’s arrival, it suited me to begin my writing life in solitude. That’s brilliant! Do you now belong to any critique groups? 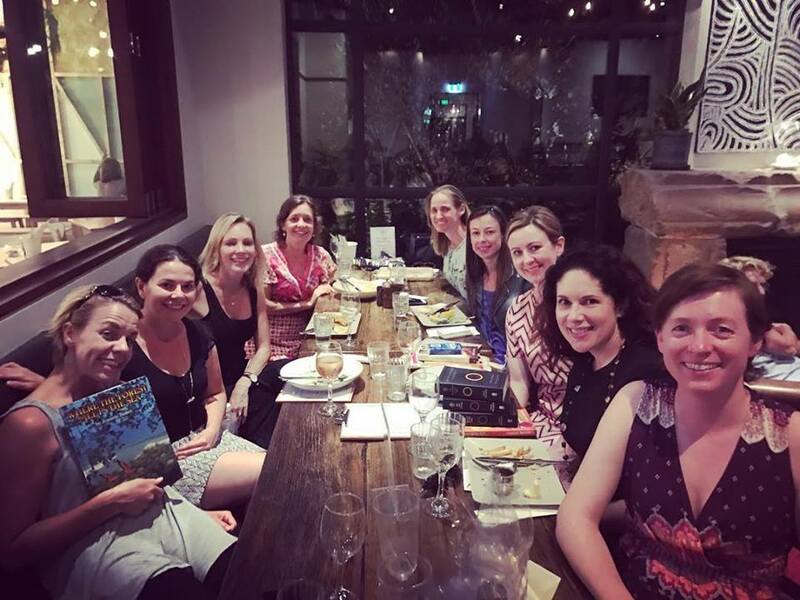 After I had signed two picture books, I joined a picture book critique group through Writing NSW. I had met some of the writers around the traps and I wanted to see what sharing my work and helping others with theirs would do for my writing. I’m still part of that wonderful group and I really value the feedback my critique buddies provide, as well as the friendships I’ve made. I’ve found that assessing high quality work is a great way to improve my own skills as a writer, not just in editing but in all aspects of the craft. Last year, I also joined a chapter book critique group that some of my PB friends were in, and I’m finding that equally as valuable and enjoyable. Initially, I did try critiquing with another budding writer online but I’m actually more comfortable with real-life meet-ups, with both written and verbal feedback given within a group setting. I found the same thing! I think online critiquing is tempting if you are shy (like I am) but paradoxically, I found face to face much easier and less stressful. I found it so much easier to have a free-flowing conversation than it is when you’re second-guessing everything you write! It would take me far longer to write than to say! But then, they are great if you can’t get to ‘real world’ group, and I know other authors who belong to both online and real-world groups – the best of both worlds!